He was the 121st emperor of Japan whose name was Osahito. He was born in 1831 as the fourth son of Emperor Ninkō and tutored by KONOE Tadahiro. In 1835, he formally became an imperial prince (shinnō) in 1835. He became Crown Prince in 1840 and succeeded to the throne in February, 1846. On the following year, the enthronement ceremony was conducted. Then He ordered the shogunate to report him about the strengthening of coastal defense and the foreign situation. In 1853, Commodore Perry's squadron visited Japan and the convection of Kanagawa was concluded in 1854. And in 1858, conclusion of the Treaty of Amity and Commerce between the United States and Japan was arranged but the Imperial sanction was not given to the matter. It is said that some people who were against the conclusion appealed to some aristocrats to prevent the emperor from giving the sanction. He was a conservative man and opposed opening the ports in Kinki region. After a lot of argument, II Naosuke concluded the treaty without the Imperial sanction. Besides he made TOKUGAWA Yoshitomi (Iemochi) the 14th shogun and arrested and executed those who opposed him (Ansei Purge) but at last he was killed by the ronins of Mito domain. After the death of Naosuke, administrative reform was carried out by some daimyos and SHIMAZU Hisamitsu (*). After that Kōbu-gattai movement was accelerated and his younger sister Princess Chikako (Kazu-no-miya) married Iemochi. Though she got engaged to Prince Taruhito of Arisugawa, she was forced to go to Edo and live in Ō-oku. And some radical royalist aristocrats supported by Chōshū samurais raised their heads. They planned to manipulate him as they like but at last they were expelled from Kyoto to Chōshū by the domains of Aizu and Satsuma. At that time, some false sanctions were given. Such things troubled him so much. Then the power struggle of shogunate, aristocrats, samurais of major domains got serious and his authority declined. Some people like ŌKUBO Ichizō and IWAKURA Tomomi threw out a hint that they criticised him especially after the sanction of the second subjugation to Chōshū was given. He passed away in December, 1866. The cause of death was smallpox. Some say that he was poisoned but it seems to be just a legend. He trusted MATSUDAIRA Katamori who was the lord of Aizu domain and in charge of protecting Kyoto. 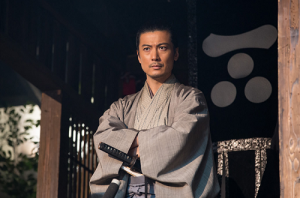 So his demise and the death of Tokugawa Iemochi disappointed Katamori. On the contrary, he disliked Chōshū as the samurais of the domain plotted a rebellion with radical aristocrats. Though he was not eager to open the country to the world, he was presented a pocket watch by James Buchanan Jr.
(*) Hisamitsu was not a daimyo but exerted the power as father of Shimazu Mochihisa, lord of Satsuma domain. She was a daughter of NIRE Kagenori who served Satsuma domain. She married SAIGŌ Kichijirō as his second wife. Kichijiro's first wife was called Masu and they had two children, Mitsu and Takanori. 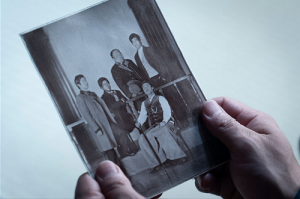 They lived in poverty because of the second exile of Kichinosuke and his brothers' confinement caused by it. Soon after she died of illness so Kichijirō remarried her. When the Boshin War occurred in 1868, her husband Kichijirō went to front and died in the Battle of Hokuetsu. As Kichinosuke and his youngest brother Kohei died in the Satsuma rebellion, there were three widows in the Saigo family after the rebellion. Then Saigō Jūdō, one of the brothers of Kichinosuke and was an army officer tried to support them but Ito, wife of Kichinosuke refused it. Later Jūdō built a house in Také in Kagoshima and then they lived together with their children or adopted daughter Kikukusa (daughter of Aikana), KAWAGUCHI Seppō and Kumakichi. In 1885, her son-in-law Takanori accompanied Toratarō, son of Ito who received Imperial Donation and departed for Germany to study. 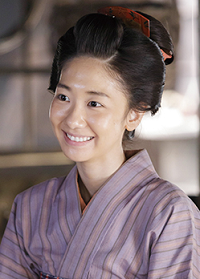 Her daughter-in-law Mitsu married a son of the Adachi family that was the family of a doctor to daimyo. She died in Kagoshima in 1896. In this series, she is described as a first wife of Kichijirō. She is a bright woman who manages the family well and an adviser of Ito. In Kyoto, HITOTSUBASHI Yoshinobu entertains Michel Jules Marie Léon Roches, French Ambassador to Japan with the dance of Fuki. Then he asks him to make French ships sail toward Kobe. As he expects, they threaten the people in Kamigata (Kansai region) includes those in Kyoto and they are in panic. ŌKUBO Ichizō thinks that Yoshinobu attempts to shake the Imperial Court to obtain the Imperial sanction of subjugating Chōshū again (*). Kichinosuke regrets having broken the appointment of meeting Katsura Kogoro in Shimonoseki. If he could met him then, the alliance of Satsuma and Chōshū must be formed now. And Yoshinobu tells Emperor Kōmei if he ha cannot obtain the sanction, the shogunate give up the politics. So he finally gets the order of the second subjugation of Chōshū. Kichinosuke and Ichizō visit IWAKURA Tomomi who is angry with the sanction and He doesn't need the help of Satsuma domain any more. Ichizō tells Kichinosuke that he puts up a bluff as usual but at that moment he suffers from stomachache, his chronic disease. Kichinosuke brings him to the house where he lives with O-Yū who becomes his lover. After taking medicine, he shows Kichinosuke his document that says the Imperial sanction is not a sanction unless it achieves a consensus of the people and he obviously opposes detaching the troops to the second subjugation of Chōshū. 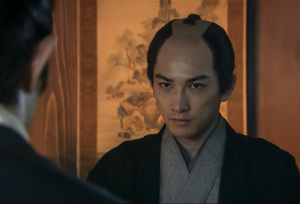 Kichinosuke worries about him but he declares that Satsuma domain will be regarded as rebel if he doesn't decide it. Kichinosuke is surprised with his decision but signs the document (**). The copies of the document become widespread among the aristocrats and the samurais of some domains. Some of them are delighted with Ichizō's idea but Yoshinobu is dissatisfied with it, needless to say. And Kogorō still has a distrust of Satsuma domain disagrees the idea. Many samurais of Satsuma domain claims about it also because they don't trust Chōshū domain. But Ichizō is eager to meet Kogorō. Kichinosuke goes to Nagasaki to visit Kameyama Shachū, a company of Sakamoto Ryōma to supply arms as Chōshū domaincannot purchase them by themselves because of being emperor's enemy. Ryōma and his partner NAKAOKA Shintarō also know about the document. After that, they go to Chōshū to sell Minié rifle, the latest model rifle at that time. "Give me a breaK. You are going to kill all Japanese". 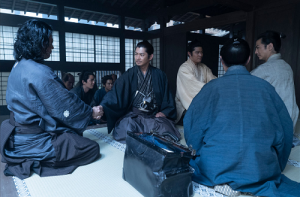 But Kogorō tells him his real purpose is making a good profit by selling arms and such a man cannot understand the pride of samurai. 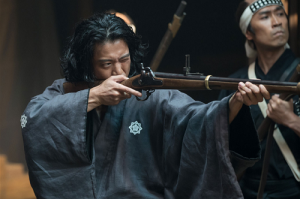 Kogorō leaves the room and sees the garden where soldiers who undergo military training rumours that they don't like satsuma but the latest model gun is attractive. It touches his heart. After he left, Ryōma hands a photograph and letters to ITŌ Shunsuke (later Hirobumi), who accompanies Kogorō. He advises Shunsuke to think big. 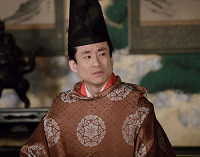 In January on the following year, Kogorō and Shunsuke who are in disguise visit Kagiya. He shows Kichinosuke, Ichizō and MURATA Shinpachi the terms of the agreement but they are so advantageous to Chōshū. Kichinosuke asks him to give him some time and argues it with his comrades including the chief vassals as KATSURA Hisatake and KOMATSU Tatewaki. As the meeting is scheduled to be hold on the next day, they have no time to ask for Hisamitsu's instructions. Besides one of the terms says that Satsuma will fight together with Chōshū when the time comes. 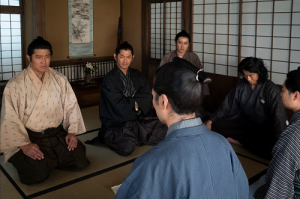 Tatewaki tells Hisatake, Kichinosuke and Ichizō that they should not say anything until the representatives of Chōshū domain bow their heads. On the following day, both sides do nothing but glare each other. Suddenly the samurais of Satsuma who are is dissatisfied with the alliance intrude into the residence of Tatewaki where the meeting is hold. Both Kakunosuke and Takeji are included in them and insist the alliance should not be formed as Chōshū people are emperor's enemies. Kogorō who becomes irritated tries to go out but Shusuke shows him the photograph of the students at that moment. In the photograph, the students from Satsuma and Chōshū who study in the UK (***) are relaxed. 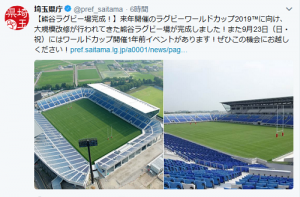 And it is said a student from Chōshū is provided financial support by the other student from Satsuma. Ryōma tells them not to oppose each other because of the difference of the domains they belong to. At last Kichinosuke bows his head to Kogorō and Shunsuke. Then other Satsuma samurais includes Tatewaki bow their heads to Kogoro. Takeji, who hesitates to do so finally bows his head to them unwillingly. Kogorō says that the Satsuma samurais are good diplomats. Then Ryōma tells Kichinosuke to "shéku hando" (shake hands) with Kogorō and then he shakes hands with Ichizō. After that, another term is added and the Satchō Alliance is formed secretly on the 21st January, 1866 (****). (*) In actuality, Yoshinobu didn't tell Léon Roches such a thing and the Imperial sanction of subjugating Chōshū again was already given to him at that time. (**) Some say that Ichizō already told some aristocrats about this idea and it was not his idea but that of Satsuma domain then. (***) Shunsuke studied in the UK also. (****) As the alliance was a secret agreement, they gather at Tatewaki's residence with the lesson of playing the biwa (Japanese lute) as an excuse. In the party after the alliance was hold, a performer called KODAMA Tennan played the biwa. KOMATSU Tatewaki was good at playing the instrument also. 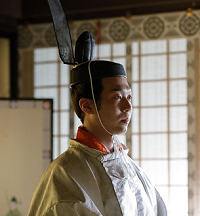 He was born in 1824 as the fourth son of Prince Kuni-ie of Fushimi. He was an imperical prince (shin-nō) who was also called Seiren-in-no-miya, Awata-no-miya, Kaya-no-miya, Fushimi-no-miya and Kuni-no-miya. He became an priest in 1838. He tried to prevent the Imperial sanction for the ratification of the Treaty of Amity and Commerce Between the United States and the Empire of Japan. Besides he supported HITOTSUBASHI Yoshinobu for the 14th shogun so he was forced to be confined in his house because of the Ansei Purge. After the assassination of II Naosuke, he was pardoned and in 1863 he returned to secular life and called himself Nakagawa-no-miya. As having been the leader of kōbu-gattai movement, he was nearly killed by radical samurais who supported radical royalism and expelling foreigners (sonnō-jōi ha). Then he attempted to banish some radical aristocrats from Kyoto with the cooperation of the domains of Aizu and Satsuma. After the Kinmon Incident in 1864, the shogunate detached troops to subjugate Chōshū but in the second one the army of the shogunate was badly defeated. 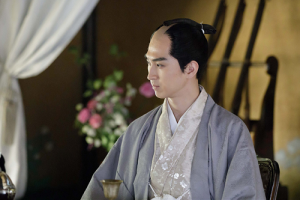 The shogunate lost its centripetal force and he also lost his influence in the Imperial Court especially after the death of TOKUGAWA Iemochi and the demise of Emperor Kōmei. After the Meiji restoration, he didn't move to Tokyo to join the new government. He kept living in Kyoto and died in October 1891. He is a great grandfather of Emperor Akihito. In this series, he is describes as an aristocrat who arranged Sanyo-kaigi and supports Kōbu-gattai movement. He interacts with Hitotsubashi Yoshinobu who gives Iwakura Tomomi's letter to him in exchage for money to teach him what Tomomi thinks.